Geoff has been playing jazz since his early teens originally as a drummer but quickly switching to Alto Saxophone. As a professional musician since 1977, he has played at concerts, clubs and festivals in all parts of the U.K. and has worked abroad extensively in Europe, Scandinavia, West Africa, Bahrein, Dubai, and the Far East. Recordings include albums with his own quartet, two L.P's with Danny Moss (which were voted among the top records of the year by Jazz Journal), albums with Billy Butterfield and Yank Lawson, and most recently with Dave Cliff including the much praised C.D's 'The music of Tadd Dameron' released in 1997 and the marvellous duo and quartet recording of the previous year - 'Sipping at Bells '. Geoff leads his own quartet and works as often as possible with Dave Cliff in a variety of settings from duo to quintet, and is increasingly in demand as a guest at jazz clubs and festivals throughout the U.K. 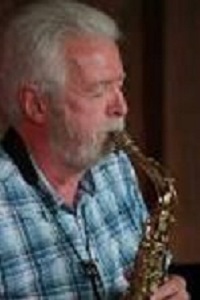 He often works with American musicians who are visiting this country and over the years has played with such luminaries as Art Farmer, Bobby Shew, Al Cohn, Tal Farlow, Slide Hampton, Warren Vache, Al Grey, Kenny Davern, Bill Berry, Al Casey, Howard Alden, Ruby Braff, Bill Coleman and Conte Candoli. Geoff is a respected teacher and as well as running a very successful improvisation course at Sussex University, he is a regular tutor at the famous Glamorgan Summer School. Geoff has also been involved in many of the Jazz In Education projects which have brought live music to schools throughout the South and Midlands. Geoff Simkins (as), Danny Moss (ts), Brian Lemon (p), Len Skeat (b), Derek Hogg (d). If Dreams Come True/Then I'll Be Tired Of You/I'm Beginning To See The Light/Got The World On A String/Don't be That Way/The World Is Waiting For The Sunrise/Royal Garden Blues/Don't Blame Me/Fine And Dandy/Weaver Of Dreams/Candy. Street Of Dreams/Just You, Just Me/You've Changed/Jones/In A Mellotone.
? Struttin' With Some Barbecue/It's Allright With Me/Careless Love/Stompin' At The Savoy/I Want To Be Happy. Geoff Simkins (as), Frank Taylor (g), Adrian Kendon (b), Dave Wickins (d). Are You Real?/Turnaround/Skylark/You Stepped Out Of A Dream/Like Someone In Love/Cry Me A River/Blue Daniel/The Days Of Wine And Roses. Geoff Simkins (as), Dave Cliff (g), John Pearce (p), Alec Dankworth (b), Mark Taylor (d). The Right Time/For Minors Only/Nicole/Bird Blues/Signal/Four On Six/Valse Hot/Peace/So Do It. Geoff Simkins (as), Dave Cliff (g), Simon Woolf (b), Mark Taylor (d). Bock To Bock/Sal's Line/Easy To Love/I Guess I'll Hang My Tears Out To Dry/A Nightingale Sang In Berkeley Square/Lester's Blues/that Old Feeling/Once I Loved/Conception/Sipping At Bells/How Deep Is The Ocean*/Nobody Knows The Trouble I've Caused*/Indian Summer*/The Touch Of Your Lips*. Geoff Simkins (as), Dave Cliff (g), Roy Hilton (p), Simon Woolf, Mick Hutton (b), Steve Brown, Ron Parry (d). Ladybird/The Squirrel/A Blue Time/If You Could See Me Now/Flossie Lou/Jahbero/Hot House/Soultrane/Casbah/Good Bait/Our Delight/Interview with Tadd Dameron and Benny Golson. Geoff Simkins (as), Nikki Iles (p), Simon Woolf (b), Martin France (d). Sunflower/Don't Ask/Quiet Now/Thingin'/Estate/Little Willie Leaps/The Duke/In Your Own Sweet Way/Silence/Very Early/317 East 32nd Street/Subconcious-Lee. In January, 2001 the Allan Ganley Quartet recorded live, what is described as a session in the classic bebop style. Jazz Journal selected the CD as "one of the best CDs of the year". It is available via Allan Ganley's website. Geoff Simkins (as), Dave Cliff (g), Dave Green (b), Allan Ganley (d). Au Privave*/How Deep Is the Ocean*/Anthropology*/The Right Time*/Just In Time*/Goodbye*/Quasimodo*/Limehouse Blues*. Geoff Simkins (as), Dave Cliff (g), Simon Woolf (b). Smog Eyes/The Moon And The Rabbit/Ballad For Benrt/Passport/Falling Grace/I'm Getting Sentimental Over You/Chas/Featherbed/Waltz New/Django/Cork And Bib. Geoff Simkins (as), Nikki Iles (p), Dave Green (b). Make Someone Happy/Elsa/Sareen Juner/Nobody Else But Me/Friend-Lee/Old Ballad/Mooch To Early/For DJC/Beija Flor. This page was last updated during June, 2018.